Before you get too excited about my achieving second place with my chalk painting last Saturday in Moreno Valley, it was a very small field of competitors. I also had a small booth at the art fair and my beloved was being the store keeper for me, while I wore off my fingerprints. I discovered fairly early on that our choice of space to set up (chosen because putting Doug under the tree in the shade would allow me to use the umbrella to keep the blacktop I was working on from melting my fingers), was in front of the band. The band (there were several during the course of the day) and the between-bands background music was LOUD. So, to relieve Doug and allow him to walk around and repair his eardrums and sanity, I hurried through my work. The need for speed was exacerbated by wind which took the umbrella for a tumble and meant I had to chalk with one hand while quickly rubbing the chalk into the now-scorching blacktop with the other. I finished in 2 hours, and apparently was the only one who completely finished, though other chalkers, intending to take until 4pm created larger compositions. I had a limited amount of blue, so did the surrounding ‘atmosphere’ in red, rather than follow the original, and created far less clouds than on the mixed media painting this was based on. For this it’s more about the message than the accuracy of the map. #1217 David’s Sunset. Oil on canvas, 39×17″. $550. 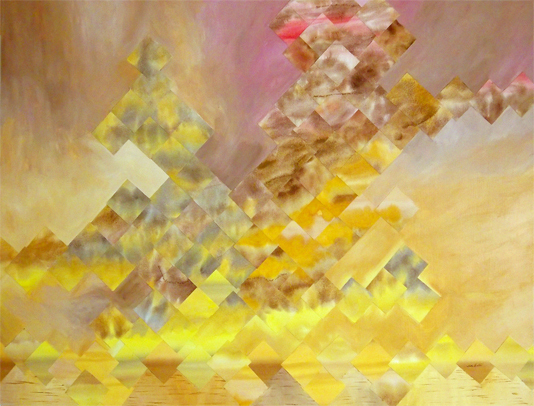 This skyscape was painted from a friend’s photograph of a sunset across the Pacific Ocean. A bit of a departure for me as my usual sun-over-water paintings are sunrises. Most west coasters think only of the sun going down into the water – but I live on a small stretch of land where it not only comes up over the water, but at about a month around winter solstice appears to come up out of the water. (I just have to be weird.) And of course this had to be a weird size of stretcher bars I up-cycled from somewhere I can’t remember. I seem to be creating a lot more water pieces these days – this is one of them. 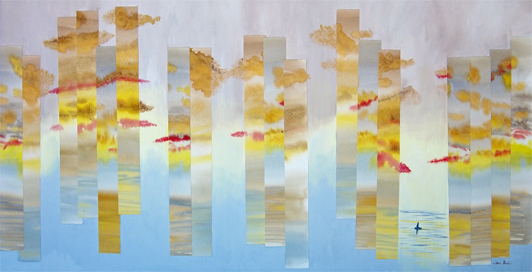 #1156 “Sailing Home” Mixed Media on panel 24×48″. $2,000. The following poem is also painted into the painting. Ocean’s View. Mixed media on deep panel. 36″x48″. $3,025. The one place in the world where the sky is bigger than anywhere else is the ocean. This, and the science behind the weather was the inspiration for the poem in this piece. This painting was the front page of my website last month. Now you can see it on it’s own page within the collages page, where you can also see what it would look like in a room. that rain back down to it, renewed. #1143 Ocean’s Draw. 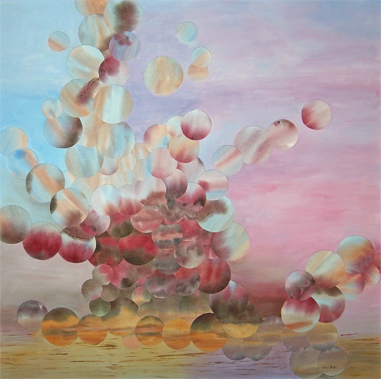 Mixed Media on deep panel, 36″x36″. $2,260. This one I don’t have any doubts about. I had it on the wall for a long time before it went into the box ready to go to its first show in Menlo Park next week. I wrote the following poem for it and painted it into the painting. relax, when gazing ‘cross the sea.